Effective litigation metrics program should include consistent formulas for calculating key performance indicators (KPIs), definitions of appropriate terms used in the analysis, and suggested standardized methodologies for collecting and tracking metrics data. Some metrics may be extremely difficult to measure and track. If the cost of tracking a particular metric outweighs its usefulness, it may be reasonable to exclude such metric from the list of key performance indicators used in litigation research and analysis. Typically, the list of litigation KPIs is determined by the law department management. All KPIs in this category will provide cause and effect ties to other perspectives. In other words, legal initiatives are aligned with strategy and company mission. Lawyers and managers will benefit from evaluation of internal and external costs per lawsuit. Attorney productivity is another popular KPI in this BSC. Download trial version of Litigation Performance Indicators. Purchase full version of Litigation Performance Indicators + bonus. Litigations are themselves 'issues that have gone haywire'. This makes for a compelling reason to bring an effective strategy for managing the controversies. Courts and law departments need such a tool to ensure that none of the parties is denied justice and that everyone receives 'what is due to them'. The parties stuck in the legal mess can be individuals, non-profit organizations and business entities. The court may order payments of damages to the victim. Coming to the efficient management part, a balanced scorecard serves the purpose of 'measuring steps and moves' in case of handling lawsuits. One can assign values and numbers to the KPIs (Key Performance Indicators) and make sure that statistics remain within the 'manageable range'. However, this job of selecting metrics for the conduct of lawsuit requires immense detailed studies to be done so as to reveal the basics that determine the success of litigation process. Once this task of figuring out the indicators is over, suitable intervals can be allotted to the metrics. Moving on, by coming back to these quantitative 'phrases', it is possible to take care of the proceedings that from part of the lawsuit process. Related metrics and KPIs for: Law Department, Intellectual Property, Court Management. Customers who viewed this item also viewed: Risk Management Pack | Project Management. This is the actual scorecard with Litigation Performance Indicators and performance indicators. 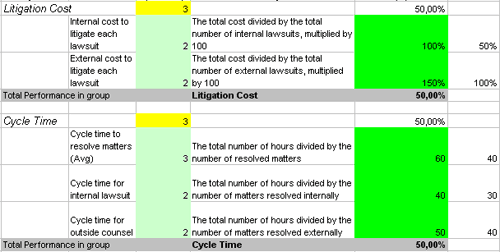 The performance indicators include: litigation, litigation cost, internal cost to litigate each lawsuit, external cost to litigate each lawsuit, cycle time, cycle time to resolve matters (avg), cycle time for internal lawsuit, cycle time for outside counsel, billed hours, internal hours billed for each lawsuit, outside counsel hours billed for each lawsuit, attorney productivity, number of cases per legal assistant, number of cases per attorney, hours spent by internal attorneys and legal assistants, hours spent by external attorneys and legal assistants, efficiency, pre-discovery resolution rate for internal lawsuits, pre-trial resolution rate for internal lawsuits, pre-discovery resolution rate for external lawsuits, pre-trial resolution rate for external lawsuits . Download a trial version of Litigation Evaluation Balanced Scorecard or purchase a full version online. All articles about measuring performance in Legal.